Wednesday, May 11 at 6:30 p.m.
Be a part of the audience of the taping of “Dive into UKIYO-E,” NHK WORLD TV’s series that brings to life one of Japan’s richest and most sensuous periods in history. “Dive into UKIYO-E” pays tribute to the 200+ year Edo period when wealth was quickly accumulated, and its urban culture was dominated by a deep love for the arts. In particular, its traditional woodblock prints called Ukiyo-e flourished during the Edo period in the 18th-19th century and served as cameras, portraying with intricacy and precision every aspect of Edo life, from Kabuki theater to courtesans parading in the ornate fashions of the day. Ukiyo-e woodblock prints were considered a form of entertainment for the masses, and each print was as affordable as a bowl of noodles. These prints were created in collaboration with master artisans – the Eshi or painter, Horishi or carver and Surishi or printer – colorfully depicting in detail the manners and customs of the Edo era. During the same era, another form of entertainment called Rakugo was popular among the commoners. It features characters in conversation and ends in a punchline. 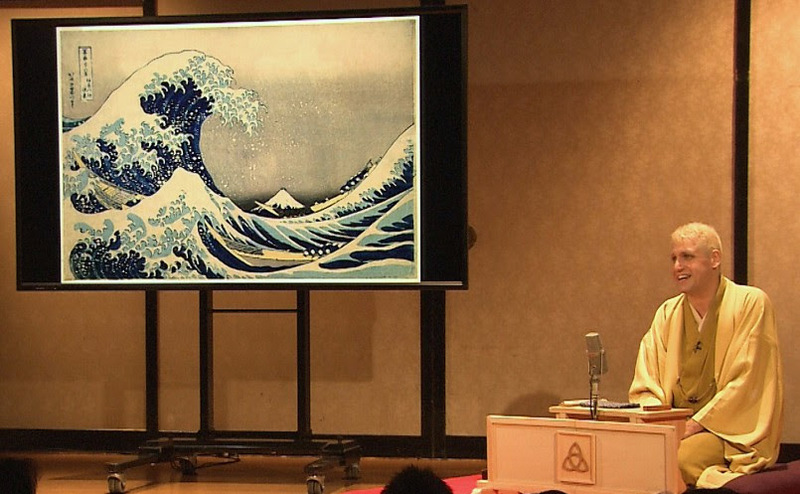 In the TV series, the program dives into the world of Ukiyo-e, exploring one of the most well preserved collections of prints, courtesy of the Spaulding Collection of the Museum of Fine Arts, Boston, and presented in Rakugo-style storytelling by Katsura Sunshine, a musical playwright originally from Toronto, Canada. The first eight episodes in the series were produced and recorded in Japan. In aims of taking it even closer to its overseas audience, NHK WORLD will hold its next recordings in the US, with tapings at Japan Society on Wednesday, May 11 and at Washington, D.C.’s Japan Information and Cultural Center, Embassy of Japan (2520 Massachusetts Ave NW) on Tuesday, May 17. The Rakugo performance show will be a one-man show by Katsura Sunshine and will be comprised of Rakugo storytelling in English and “Dive into UKIYO-E” presentation for recording. This show will be recorded and edited into eight episodes of the “Dive into UKIYO-E” series, each of which are eight to nine minutes in duration. The series will be broadcast via NHK WORLD TV US partner stations from June through October and will also be available through the live streaming service on NHK WORLD’s website and on the NHK WORLD app. Katsura Sunshine first visited Japan in 1999 where he encountered Rakugo. Fascinated, he entered into an apprenticeship with Katsura Bunshi, a famous Rakugo storyteller in Japan, and received the name “Katsura Sunshine.” He performs Rakugo in English in Japan and overseas. He’s frequently invited by Japanese embassies in different parts of the world to introduce Japanese culture through Rakugo. Pre-registration for the Japan Society taping is required. Please RSVP to sunshine@nhkcma.com with your name, email address, and number of attendees.